Let us take the guesswork out of what you should do this weekend! Continue here for the complete list of events and activities happening all around Lake County! Adrenaline junkies, in case you didn’t hear, Six Flags Great America is open for the season! You can buy your tickets here. You’re welcome. Pack away your winter coat because this weekend is looking pristine! Without any further adieu, here are the top things to do this weekend April 27-29. Libation lovers will enjoy an afternoon of brews at Long Grove’s Craft Beer Festival. The 21 and over festival occurs on the historic streets of Long Grove where attendees will partake in sampling a variety of beer from local breweries such as Buffalo Creek Brewing, Half Day Brewing, Tighthead Brewery, ZumBier and more. Get in the groove with Bellwether Blues and Jake Mack and the Lesser Stags as they perform live music. Tame your hunger with food for purchase from Signature Popcorn, Pizzeria DeVille and Chicago Culinary Kitchen. The craft beer festival will occur rain or shine so dress accordingly. Saturday, April 28; Noon – 6 p.m. Non-Drinker admission: $15, Regular admission: $40-$50. Historic Downtown Long Grove, 360 Historical Ln., Long Grove. “Dance is the hidden language of the soul” – Martha Graham, the legendary dancer and choreographer. Witness a night of entertainment like none other at the James Lumber Center for the Performing Arts’ 20th annual Fear No Art Festival. The Grayslake celebration features a variety of artists performing music, dance, poetry, visual art displays and more. All entertainers at the festival are College of Lake County students and local community members. Friday-Saturday, April 27-28; Fri. 7:30 p.m., Sat. 2 p.m. & 7 p.m. Admission $8-$10. James Lumber Center for the Performing Arts, 19351 W. Washington St., Grayslake. Shake the very foundation of the British Empire with the Citadel Theatre’s newest comedic production, “The Explorers Club”. This Lake Forest production spoofs a group of Victorian adventurers as a brilliant, beautiful woman attempts to join the exclusive club. Although she has discovered a legendary lost city and earned the prerequisite for membership, the admittance of a woman to their prestigious group could shake the British Empire – somehow. “The Explorers Club” runs through May 27. Friday-Sunday, April 27-29; Fri. & Sat. 8 p.m. Sun. 3 p.m., Admission $35-$40. Citadel Theatre, 300 S. Waukegan Rd., Lake Forest. 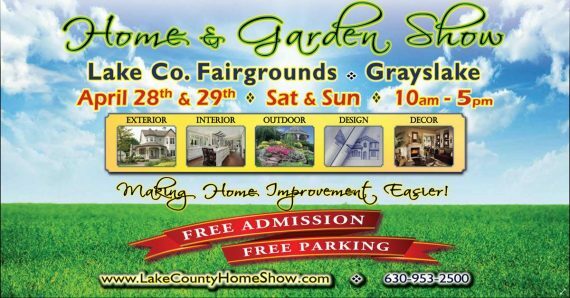 DIYers won’t want to miss a “shingle” day at the Home & Garden Expo at the Lake County Fairgrounds and Event Center. The free Grayslake event will offer interactive exhibits, professional advice, coupons, discounts and more to assist and inspire attendees with future home and garden projects. Saturday-Sunday, April 28-29; 10 a.m. – 5 p.m. Free admission. Lake County Fairgrounds and Event Center, 1060 E. Peterson Rd., Grayslake. Hobbyists, collectors and others can spring into the season at the Gurnee Antique Market Annual Spring Sale. Shoppers can enjoy 15-40 percent off items from the massive store that stretches over 21,000 square feet. Peruse the unique mid-century modern furniture, silver, lighting, jewelry, table and barware, home accents and more at this enormous spring sale. Friday-Sunday, April 27-29; Fri. & Sat. 10 a.m.-5 p.m., Sun. Noon-5 p.m. Free admission. Gurnee Antique Market, 5742 Northridge Dr., Gurnee. For more details on these and other events that are not the top things to do this weekend April 27-29, continue here.